I stayed here with my husband and some friends of ours and couldn't have asked for more. Andreas was super helpful when we arrived, gave us a map and told us where all the best beaches and restaurants are (and he was right about every suggestion!). The rooms were perfect for what we needed, very clean, cosy, beautifully decorated and the Italian shower was a dream! We had a plate of watermelon on arrival and bottles of eater, and half way through our stay he also gave us homemade cake that had been made that day. The accommodation is very close to the boat port which was ideal and a 3 minute walk to a beautiful beach with clear turquoise water that felt like swimming in a swimming pool! Would highly recommend and would love to come back! Thank you so much for your good words. It was lovely having you in Filoxenes Katoikies / Sole e Mare . We send you our best wishes . I went to Villa Venus a year ago ( 3 weeks in August) with a couple of friends and everything was perfect. Andreas, the owner of Filoxenes Katoikies, was very fast in communication, kind and he provided us with lots of suggestions. Villa Venus is the perfect place, a paradise with a beautiful view towards the seaside. Me and My boyfriend rent a flat, and the other couple rent the small house. Both were very clean, cozy and full equipped. 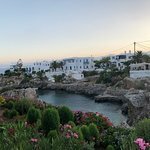 If we had to come back to Kythira we surely would rent again the same flat in Villa Venus. Thank you so much for everything. For your lovely review and the fact that you continue to choose Filoxenes Katoikies. Maybe in the years to come we might have another lovely property. I have stayed here on and off for 7 or eight years now. I normally visit at the beginning of the season as Diakofti is at its quietest then. 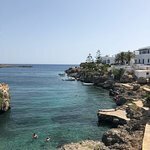 I find that arranging the trip, via e-mail, with the owner, Andreas, is very simple and find Andreas very accommodating when helping to arrange car hire, etc. The apartment was cleaned daily during our week-long stay and we were able to cook for ourselves with the facilities provided. True, the two tavernas were not yet open, but this is a factor of going so early in the season. We dined a few times at the taverna at Scandeia (recommended by Andreas), a couple of miles down the coast, which was lovely. Overall, a very lovely and stress-free stay, as usual. Thanks Andreas. It is always really nice to have you in Sole e Mare. We would like to thank you for your review, and as always it would be lovely to have you back. Let me start by saying that I am puzzled by the number of positive reviews for this guesthouse. The reviewers seem to be particularly impressed by the owner's helpfulness and the quality of the rooms. I will tackle those in order: first, I did not once see the owner. Not once did he show his face to me or give those tips the internet seems to be raving about. I was very much on my own (something I normally expect, but where did all the hype come from?). Thank goodness his wife (daughter?) was around when I arrived to show me into my room. Second, the room was fine. It really was in line with what I normally rent for about 30 EUR a night on any other Greek island (I have visited 45 Greek islands to date). Except this one was 50 EUR a night, was not cleaned once during my 3-day stay (indeed I doubt a single soul remembered I was there), and did not *really* have sea view. The sea view had been carefully preserved for the front rooms generously occupied by the owner's family (God bless them). And was there breakfast? God, no. Who ever makes it given there isn't a single soul to meet? I have a confession to make: I made a mistake when I booked this place. Because every other Greek island's port seems to be a lively, happening area, I booked myself into the port without much research thinking that it would be the same. I realised my mistake days before the trip, panicked about not being able to cancel anymore without incurring a 50% penalty, and emailed the owner, pleading him not to take the money and let me get out of the reservation. I could not drive well, I was not interested in a beach (the only attraction of the village, it seems), and I really needed to be somewhere with more people around. It was my mistake, but what did the owner do? First, he charged me the 50% immediately. Second, he told me a series of lies. 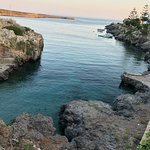 The village had the island's only good taverna (exact words "there is no good taverna elsewhere"), a mini market and a great beach. I arrived to all three being lifeless and not due to open for at least a week. Really, Andreas? Is this how you sell your village to others - through letting them pay for their own mistakes with your lies? I would like to thank you, Andreas, for opening my eyes to a series of things. First, I did convince the crew in the only taverna in the village to open a little earlier just to keep me going for a few days. I met some amazing people there, and still thank the skies for those encounters. I told the story about you to pretty much everyone who stopped by, and we all had a good laugh. Do ask for your new nickname next time you are actually in the village. Second, despite being a poor driver, I needed to get out of that dead place and rented a scooter. Because I am a horrible driver, I had a mini accident and ended up with a swollen foot - obviously not your fault. However, I am now a much more confident driver, and will hopefully not have to plead to people like you in the future. Third, you have reminded me about the importance of prior research. I may have visited dozens of Greek islands, but it was you that reminded me about the importance of not becoming complacent and about doing my research properly. I will make sure in the future to explore tripple, quadruple, before booking myself into a closed coffin of a village like yours. All the positives in mind, I did get tired of the dirty room after three days. How difficult is it to clean a room? For that, two stars. I hope my 175 EUR deposit lasts you through that tough winter. Room tip: If you're stuck, choose the lilac room. If you can go elsewhere, do go elsewhere (Chora, Kapsali, Agia Pelagia). I am not sure how I can reply to this comment. To start with we could have definitely charge you with a bigger amount of money according to the greek regulations. We did not. We have informed 3 days before your arrival that you wanted to cancel your reservation due to a mistake, when the reservation was done on February. We gave you the option to stay for 3 nights so that you can pay the amount that has been charged. Without charging more. I could still do it after all this bad comments but I will not. We did not lie about tavernas, this is what we have informed, that there will be open and it was opened in your 3rd day of your stay. We did not know until the last minute if you were coming or not simply because you did not inform us. You have been in your room for many hours and we could not come and clean your room. This is not an excuse of course and this is our only mistake. However, being so negative, and unfriendly from the beginning as it was our mistake , you did not make things easier. I did though came to see you in day one , but you were not there. In my emails I informed that I could assist you going around . You did not come to find me in my office or house. All in all , it is easy to accuse us, but to us you have been a very difficult customer. When someone tries to assist you , I did that in my emails and I can also attach them if I can, you are not impolite or rude. And you were. So all this are important for the reader to understand that we certainly disagree with your review, and of course Diakofti is a lovely place but certainly not for customers travelling alone without a car or motorbike, as the island lacks transportation. 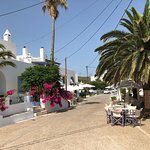 Just to inform you , in the same period, we had an Italian couple that could not drive, but we took them to Avlemonas and Chora, simply beacuse they were really friendly and polite. It is very convenient to accuse others for our own mistakes. Now we have our first bad review, simply because we accused to cancel for free in the last minute to an ungorganised person to say the least. Very comfortable bed in Diakofti, where you can find the most beautiful beach on Kythira. The apartment is tastely furnished, lately renovated and very clean, with free wi-fi. We were offerred some home made cakes and marmelade, which were delicious. The owner is very friendly and provided us with all the necessary information. It was a good starting point to other attractions of the island.